Leah Hogsten | The Salt Lake Tribune Ogden's ever popular Bonneville Shoreline Trail, Oct. 10, 2018. Hikes to OgdenÕs Waterfall Canyon traverses private land. Leah Hogsten | The Salt Lake Tribune ÒTrail users donÕt seem to be able to find the [garbage] cans, said Rainbow Gardens owner Bill King of those who use his parking lot as he picks up litter to throw away in one of two trash cans next to the trailheads. King and his siblings own acreage at the mouth of Ogden Canyon, land that encompasses their restaurant and gift shop and trailheads to half a dozen hiking and biking trails, Oct. 10, 2018. Leah Hogsten | The Salt Lake Tribune Ogden landowner Chris Peterson has signs posted Oct. 10, 2018 along the Bonneville Shoreline Trail, running through his TR Guest Ranch, a property that encompasses the Ogden foothills from 29th Street to the ridge of Malan's Basin. This sign on the Waterfall Canyon trail reads Unlike the National Forest, the TR Guest Ranch is private property and is not supported by tax dollars. If you appreciate being able to hike or mountain bike or walk your leased dog on the four TR Guest Ranch trails that are ope to the public, please make a donation. The 3.75 miles of TR Guest Ranch private trails that are open to the public are a) 29th St. to Waterfall, b) 29th St. to Taylor Canyon, c) Taylor Canyon to Malan Peak and d) the Bonneville Shoreline Trail inside the TR Guest Ranch gates. All other trails and activities on the TR Guest Ranch require a fee and a TR Guide, and can be booked at ZipUtah.com Trail closures are infrequent, but they happen a few times per year, and are normally posted in advance at OgdenFoothillPrivateLand.com. Leah Hogsten | The Salt Lake Tribune Rainbow Gardens owner Bill King and his siblings own acreage at the mouth of Ogden Canyon, land that encompasses their restaurant and gift shop and trailheads to half a dozen hiking and biking trails, Oct. 10, 2018. Leah Hogsten | The Salt Lake Tribune Regan Moyes and friend Ryan Quinn of Ogden walk Moyes' dog, Baloo, almost daily along the Bonneville Shoreline Trail, Oct. 10, 2018. Ogden landowner Chris Peterson has signs posted on the Bonneville Shoreline Trail, running through his TR Guest Ranch, a property that encompasses the Ogden foothills from 29th Street to the ridge of Malan's Basin. This sign on the Waterfall Canyon trail reads Unlike the National Forest, the TR Guest Ranch is private property and is not supported by tax dollars. If you appreciate being able to hike or mountain bike or walk your leased dog on the four TR Guest Ranch trails that are ope to the public, please make a donation. 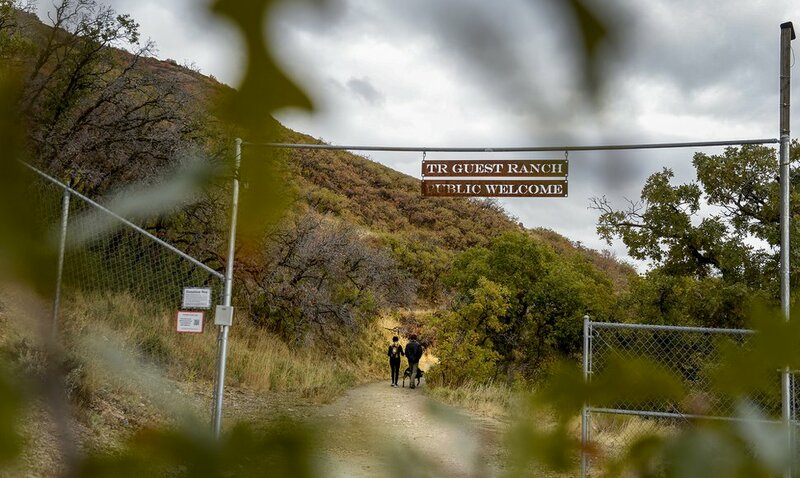 The 3.75 miles of TR Guest Ranch private trails that are open to the public are a) 29th St. to Waterfall, b) 29th St. to Taylor Canyon, c) Taylor Canyon to Malan Peak and d) the Bonneville Shoreline Trail inside the TR Guest Ranch gates. All other trails and activities on the TR Guest Ranch require a fee and a TR Guide, and can be booked at ZipUtah.com Trail closures are infrequent, but they happen a few times per year, and are normally posted in advance at OgdenFoothillPrivateLand.com. The closure soon was lifted when Washington County reached an agreement with the landowners, but this issue could spring up again and again across Utah where trails cross private property en route to popular destinations, especially along the Wasatch Front. 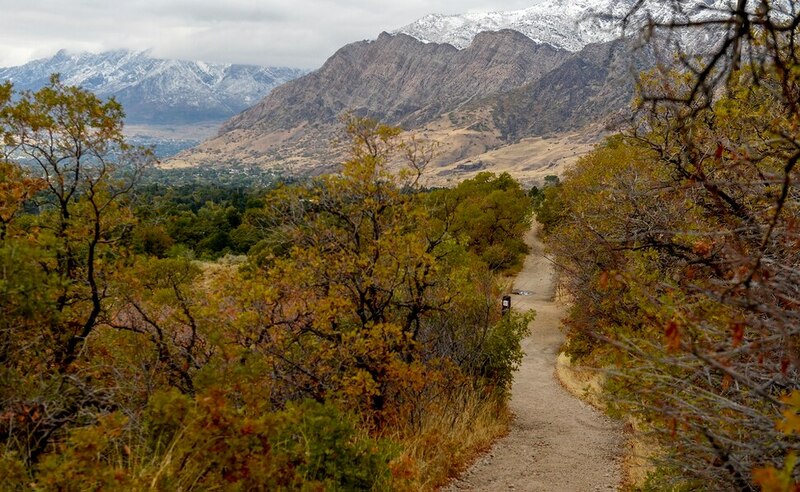 For the past 20 years, for instance, northern Utah’s ever-popular Bonneville Shoreline Trail has cut through the King family’s land at the mouth of Ogden Canyon, where the Kings’ Rainbow Gardens gift shop and restaurant have served as a trailhead and parking area. Bill King likes providing public access to the Wasatch foothills, but he wishes trail users would pick up their garbage, leave the parking spots in front of the restaurant to diners, and do more to care for the trails, which he fears are becoming magnets for crime and illegal camping. 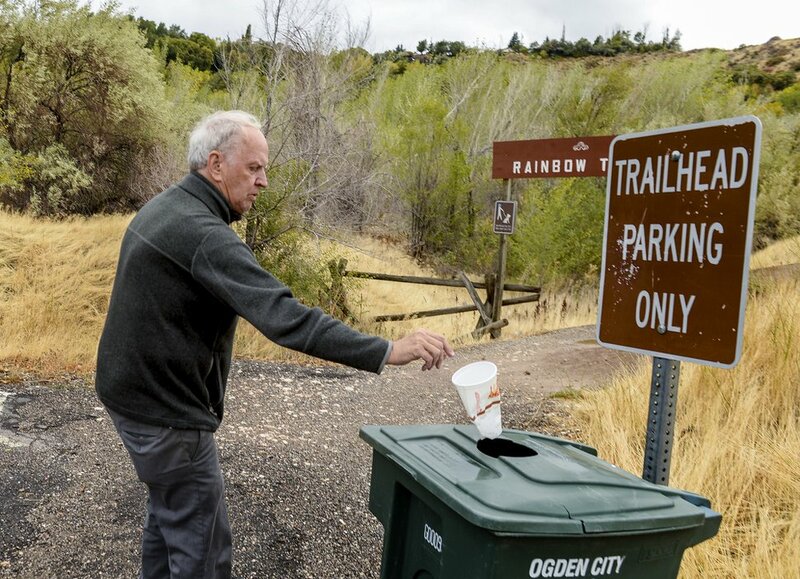 Leah Hogsten | The Salt Lake Tribune "Trail users don't seem to be able to find the [garbage] cans," said Rainbow Gardens owner Bill King of those who use his parking lot as he picks up litter to throw away in one of two trash cans next to the trailheads. King and his siblings own acreage at the mouth of Ogden Canyon, land that encompasses their restaurant and gift shop and trailheads to half a dozen hiking and biking trails, Oct. 10, 2018. In an agreement with Ogden, the Kings provide 10 parking places on the southwest corner of their lot near the trail. But they have the right to revoke access across the property it has held since the 1930s, severing a key segment of Bonneville Shoreline Trail through Weber County. As outdoor recreation continues to boom in Utah, whose scenic public lands draw tourists and businesses in droves, the state is saddled with an intensifying problem: Hikes to popular spots — from Ogden’s Waterfall Canyon to Zion National Park’s Orderville Canyon and Hop Valley, often traverse private land that is only growing more and more valuable. And many owners want either to be compensated for the public’s use of their property or pursue lucrative development opportunities. The public cannot take favorite destinations for granted. Property owners could cut off access at their discretion, so resolving these conflicts is vital to the future of Utah’s economy and quality of life. Periodic limits on access crop up on at least two of Utah’s most-renowned hikes, Waterfall Canyon and the Zion Narrows. In both cases, trails cross land where owners hope to sell conservation easements that would guarantee public access in perpetuity. But they complain the federal government is lowballing the market value of their property’s development potential, so they are balking at accepting a deal. Leah Hogsten | The Salt Lake Tribune Regan Moyes and friend Ryan Quinn of Ogden walk Moyes' dog, Baloo, almost daily along the Bonneville Shoreline Trail, Oct. 10, 2018. 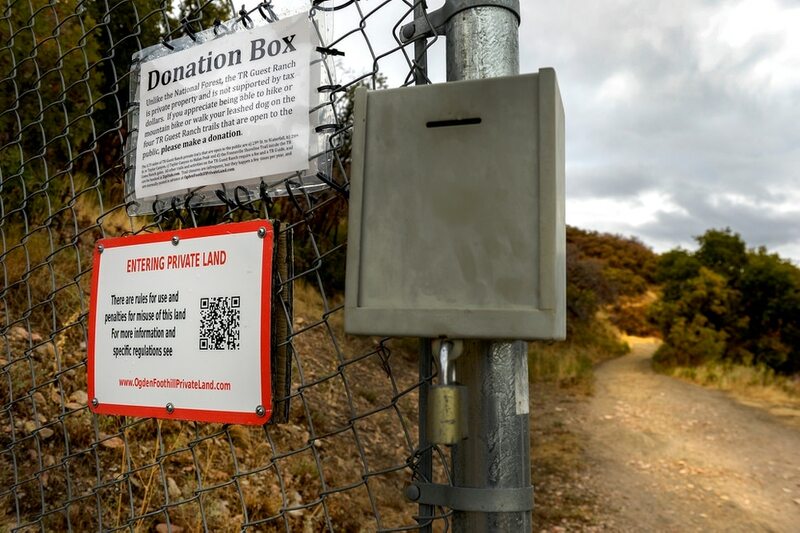 Ogden landowner Chris Peterson has signs posted on the Bonneville Shoreline Trail, running through his TR Guest Ranch, a property that encompasses the Ogden foothills from 29th Street to the ridge of Malan's Basin. This sign on the Waterfall Canyon trail reads "Unlike the National Forest, the TR Guest Ranch is private property and is not supported by tax dollars. If you appreciate being able to hike or mountain bike or walk your leashed dog on the four TR Guest Ranch trails that are open to the public, please make a donation. The 3.75 miles of TR Guest Ranch private trails that are open to the public are a) 29th St. to Waterfall, b) 29th St. to Taylor Canyon, c) Taylor Canyon to Malan Peak and d) the Bonneville Shoreline Trail inside the TR Guest Ranch gates. All other trails and activities on the TR Guest Ranch require a fee and a TR Guide, and can be booked at ZipUtah.com. Trail closures are infrequent, but they happen a few times per year, and are normally posted in advance at OgdenFoothillPrivateLand.com." Both hikes start at Ogden’s 29th Street trailhead and climb into a 1,500-acre tract owned by Chris Peterson, who acquired the land in the early 2000s and has developed the lower portions for adventure recreation, such as the Via Ferrata fixed climbing routes. The trail bifurcates at the trailhead with the right fork leading 1.2 miles to Waterfall Canyon and the left leading through Taylor Canyon to the basin above the waterfall, named for the Malan family that once ran a hotel there. From time to time, the owner has put up fences on the Waterfall Canyon trail and posted security personnel asking to see hikers’ ID. Peterson recently rejected an appraisal the U.S. Forest Service commissioned for the land. This 16-mile hike starts outside Zion National Park’s eastern boundary on Chamberlain Ranch, where access has already been protected though a conservation easement brokered by The Trust for Public Land, and winds through a slot canyon cut by the Virgin River’s North Fork. It ends at the Temple of Sinawava. The park imposes a 90-person daily limit on the one-way, top-down hike, considered among the finest in the world. A few miles below Chamberlain Ranch, the route passes through property long owned by the Bulloch family, which seeks to sell a conservation easement that would ensure public access into the future. But the federal government’s rejection what the Bullochs thought was a fair appraisal has thrown current access in doubt. Washington County officials secured a deal that will allow hikers to pass through — but only through year’s end. A permanent solution will require the feds and the Bullochs to agree on a “fair market value” for an 880-acre parcel that contains one mile of the Zion Narrows. Zion’s periphery is fraught with access issues because much of the area was private ranchland when the area was designated a national monument in 1909 and twice expanded in 1918 and 1937. The park’s famed Trans-Zion trek, connecting the Kolob Canyon area with the rest of the park via Hop Valley, crosses a private ranch whose owner is OK with the hikers coming through — for now. Also on private land is the trailhead to Orderville Canyon, another popular hike starting outside Zion’s eastern boundary and ending at the Temple of Sinawava. The park issues 80 permits a day for this 12-mile slot-canyon hike. This property also captures a technical canyoneering route through Birch Hollow Canyon, a minor tributary to Orderville Canyon. Some 3,400 acres, or 2 percent of the land within the park’s boundaries, remain private. 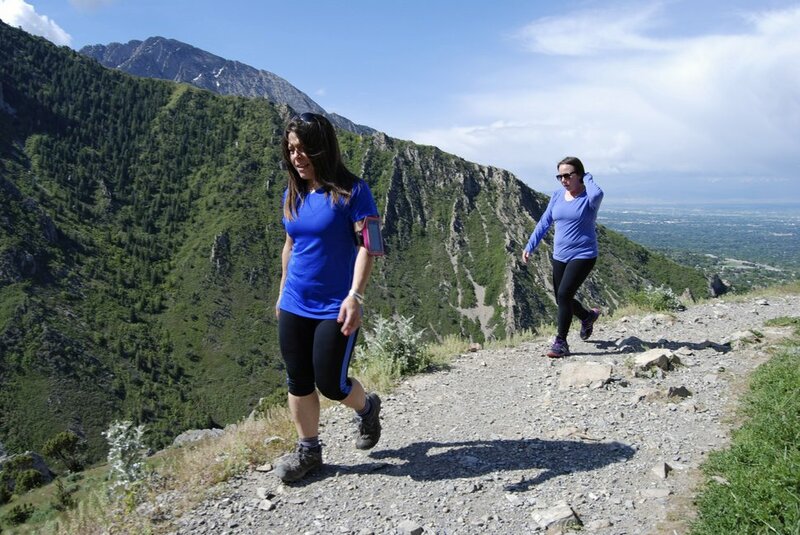 Like Waterfall Canyon, this hike starts from a residential area at the foot of the Wasatch Mountains. 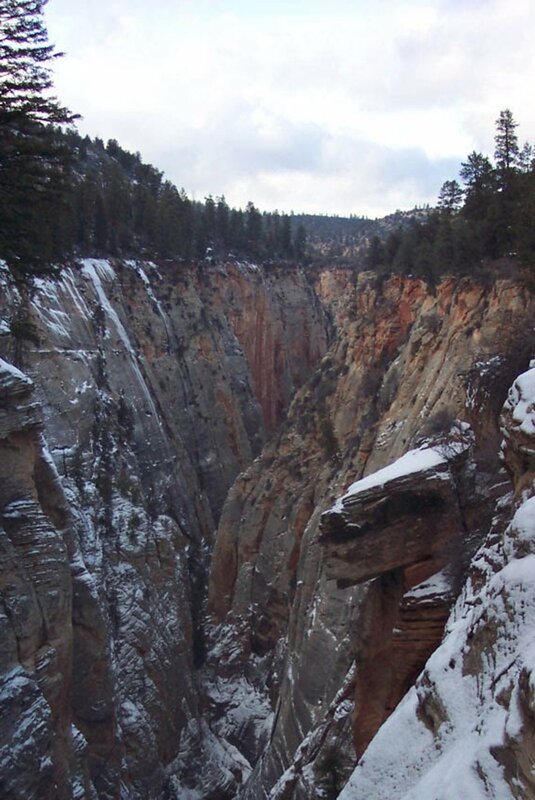 The canyon emerges from the mountains in Layton, where an informal trailhead is located just off U.S. Highway 89. The first quarter-mile of the trail crosses private land before entering national forest. The 1.8-mile dog-friendly trail along Holmes Creek ends at a waterfall, but more adventuresome hikers can continue past the waterfall to the canyon’s north ridge. They can return to the trailhead on a trail following the ridgeline for a total distance of about 5 miles. The lower portion of the route ties into the Bonneville Shoreline Trail, which also crosses private land there. This route tracks above foothill subdivisions at the approximate level of ancient Lake Bonneville, which drained away 14,000 years ago, leaving remnants like Utah Lake and the Great Salt Lake along with a series of benches carved into the Wasatch foothills indicating old shorelines. About 20 years in the making, the trail remains fragmentary with significant portions developed along its proposed reach from Nephi into Idaho. Brian Maffly | The Salt Lake Tribune Ann Tylutki, left, and Andi Hernandez hike Mill Creek Canyon’s Pipeline trail above Rattlesnake Gulch. This is a popular place to run, ski and bike just outside Salt Lake City even though these and nearby trails cross private land owned by the Boy Scouts of America. Next week, the U.S. Forest Service will acquire 847 acres from the Scouts to ensure permanent public access and help stitch together a 27-mile extension of the Bonneville Shoreline Trail south from Parleys Canyon to Sandy. May 27, 2016. Much of this trail exists only in people’s imagination and may never actually get fully developed because so much of the proposed alignment crosses foothill real estate primed for development. Some owners aren’t keen on a public thoroughfare running through their yards, while deals and agreements have been reached to ensure public access in places such as the Kings' land at the mouth of Ogden Canyon. Mostly recently, The Trust for Public Land arranged the purchase of 848 acres owned by the Boy Scouts of America on the north side of Mill Creek Canyon in Salt Lake County. This secured about of mile of the existing Pipeline and Rattlesnake Gulch trails, which are hoped to be incorporated into a continuous stretch of the Bonneville Shoreline Trail. With no compensation coming their way, the Kings have tolerated a busy mile of the trail passing through their Rainbow Gardens property. The land is located at the middle of the trail’s longest unbroken stretch, extending 22 miles through Weber County from Beus Canyon, near Weber State University, to North Ogden Canyon. The Mill Creek Canyon deal, which put $3.2 million in the Boy Scouts’ coffers, tapped the federal Land and Water Conservation Fund, which is on life support after a half-century of land acquisitions supporting outdoor recreation. The fund expired last month while Congress struggles to pass legislation that would reauthorize it. Without the fund, the private sector and local governments will have to open their wallets wider to purchase the easements needed to guarantee access. Either way, hikers will need to respect the rights of landowners if they expect to continue enjoying places like Waterfall Canyon and the Bonneville Shoreline. Not littering and clogging Bill King’s parking lot would help, too.